If anyone thought Ashutosh Gowariker is not worried about directing yet another period film thanks to the huge success of Lagaan and Jodhaa-Akbar, they should listen to the filmmaker describe his newest challenge. "It was like I was doing a period film for the very first time," he says referring to his latest film Khelein Hum Jee Jaan Sey which is set for release on December 3. "With the earlier two period films, I had a lot of freedom to create situations and embellish the characters. In the case of Jodhaa-Akbar, I could imagine many things because very little is known about what had gone into the minds of these characters in the early years of their relationship. But in the case of my new film, I was dealing with the incidents that happened 80 years ago. I had to stick to the facts and yet make an exciting film with strong performances and flavoursome music," he says. Another challenge was that he had set out to make a period thriller. And the pacing had to be very different from his previous films, some of which -- like Lagaan -- are known for their leisurely pacing. Download wallpapers, ringtones & more! The new movie, featuring Abhishek Bachchan and Deepika Padukone, is set in the 1930s in the seemingly sleepy, peaceful port of Chittagong. 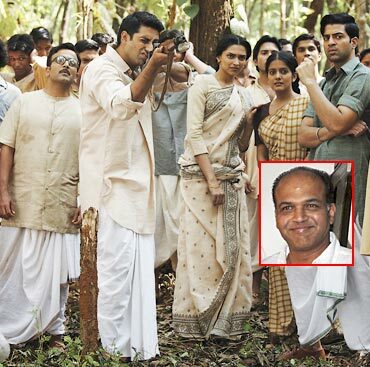 But on April 18 night, Gowariker points out there were five simultaneous attacks on the British. There are 56 young men were involved, in addition to five highly focused revolutionaries, two gutsy young women, and an idealistic school teacher-turned-militant, Surjya Sen. These may be described as forgotten heroes but it isn't that there is no documentations on them, the filmmaker says. The film is based on the book Do or Die: The Chittagong Uprising by journalist Manini Chatterjee. Gowariker and I are chatting after little over a year; our last discussion was when What's Your Raashee? opened at the Toronto International Film Festival to an excellent reception but flopped the next week. Did the failure of Raashee make him change anything in the script of his next venture? No, he says, adding that he went on to work on the project as he had conceived it before the release of Raashee. "I am starting with zero in the case of each film I make," he explains. "Of course I was sad with the failure of Raashee. But I also asked myself if I had fulfilled what I had set out to in that film. And I knew I had. I asked the film's writer and he was happy with the way the film had turned out. But I admit the film did not meet with the audience expectations of the entertainment quotient. "I do not rest on the success of my previous films," he continues, "nor do I despair over a failure " He was not resting on the success of Jodhaa-Akbar when he made Raashee, he adds, and he was not thinking of Raashee when it started to shoot KHJJS. "For me, a period film has two important aspects," he muses coming to his latest work. "One is the materialistic aspect --getting the sets, costumes and locations right. This is done by extensive research, visiting the monuments and discussions with scholars." The second aspect was a bigger challenge, he notes. "And this involves recreating the manners and thinking of the people who lived in a different age." For KHJSS research, he also visited many Bengali institutions including Shantiniketan (where Rabindranath Tagore used to live). "I soaked myself in the Bengali ethos," he says chuckling. "I am eager to see how the Bengalis are going to react to my film." He adds: "In my films, I have enjoyed creating other worlds. In Raashee, I worked in a Gujarati milieu. Exploring another culture has always fascinated me." He would have another opportunity to explore a very different culture when he directs Buddha. The English-language project to be produced by billionaire entrepreneur B K Modi was announced over a year ago with much fanfare. David S Ward, best known for the scripts of Sleepless in Seattle and The Sting was to write the script. The film was expected to be ready by the end of this year. But Gowariker isn't thinking about it even in the near future. Without finding the right person to play Buddha, the project would not go on, he reveals. "I have been looking for a person who has the innocence of Siddhartha and the maturity of Buddha," he says with a small sigh. "But I have not had a success." But is the project stil in the works? "I would not say it is alive," he adds. Who wore a dhoti best? Vote!